HOTECH New Comprehansive Collimation Videos! Collimate your SCT with Confidence! Since the invention of the Cassegrain Telescope in 1672 by the French sculptor Sieur Guillaume Cassegrain, the Cassegrain Telescope has evolved into various derivative designs such as the more popular Ritchey-Chr�tien, Dall-Kirkham, Schmidt-Cassegrain, and Maksutov-Cassegrain. The designs have gained their popularity because of their compact and simple to produce design. With different designs, star collimation is and has always been the only effective method to collimate for Cassegrain telescope owners. 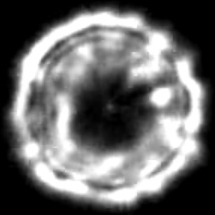 An artificial star can never simulate a real star because it is impossible to collimate with the telescope focus set at infinity. After artificial star collimation, you will need to adjust your focus back to infinity to view a real star by moving the primary mirror to a different position. The distance the primary mirror has been adjusted can accumulate mechanical tolerance errors. 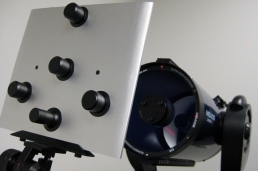 For some of the mass produced SCTs, the �sticky baffle� on the primary mirror focusing mechanism may also cause mirror-flop. If a mirror-flop has ocurred, it will affect the alignment position which in turn will render the collimation useless. 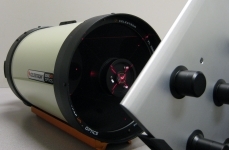 Ideally, It is best to collimate your optics at the same viewing focusing position without major optical displacements to correspond to the final view setting. The Advanced CT Laser Collimator can accomplish this task without all the possible accumulated errors. 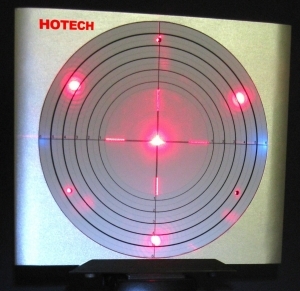 The large target display on the Advanced CT Laser Collimator brings you a clear visual cue of three projecting laser dots as the alignment reference at a very comfortable visual distance providing an accurate axial alignment error diagnostic. And during the entire collimation process, no major focusing is needed, thus minimizing the possible accumulated errors from the focusing adjustments. 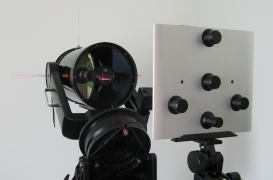 The referencing adjustments are made by bringing the three clearly discernable projected laser dots, projected on the target, into a concentric ring. 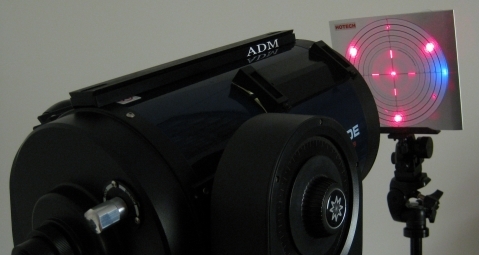 No more peeping through the eyepiece looking for a changing, ambiguous star image. 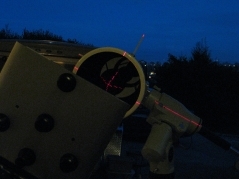 This alternative collimation method saves precious observing time by collimating the telescope and preparing the viewing programs at dusk or before dawn without the influences of the external environmental conditions. 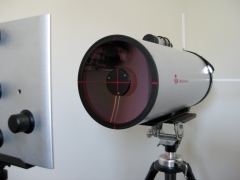 The Advanced CT Laser Collimator uses three collimated lasers, evenly spaced apart, to sample large aperture optical elements in your telescope. 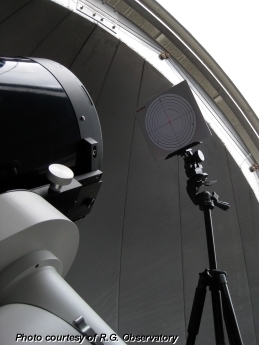 The three parallel laser beams completely simulate the light path (flat-wavefront) from a distant star and pass through the entire telescope�s optical elements and reflect back to its target for a complete and accurate double-pass diagnostic reading of your telescope optical alignment. 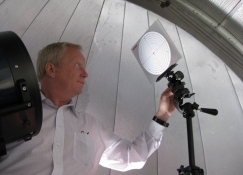 This innovative collimation technique and technology enables the amateur astronomer achieving far-field collimation as a near-field process. "It works, and it does not require a lot of space. Hell, it hardly requires any space. It's nicely made ... and is less than some of us have got used to payin' for one more eyepiece. 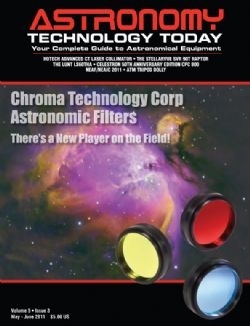 I give it two thumbs up..."
"We have used the HOTECH Advanced CT Laser Collimator on our CDK Telescope to set the initial primary to secondary collimation with good result. 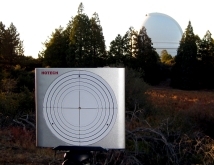 HoTech's elegant design and high quality construction allows for ease of setup and makes this an invaluable tool for collimating a Cassegrain Telescope." Due to the high demand, item will be deliver one week after order placed! Thank you for your support!